Two weekends ago my wife and I were on the road again, this time headed out to the Catskills for a Steampunk festival. Naturally no trip of this sort would be complete without getting a sense of the local flavor. 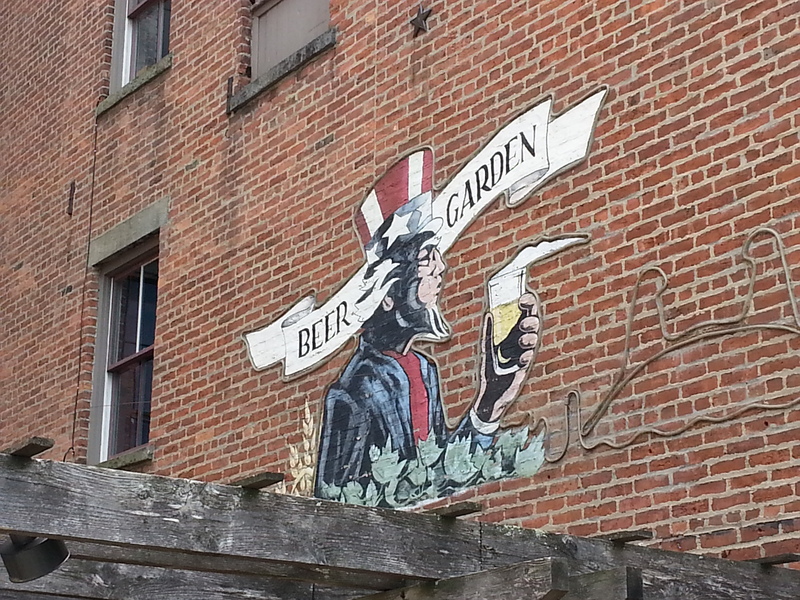 While that part of New York State is not exactly known for its beer scene, with some good luck and advanced scouting I did manage to come across a few things of note. The first stop on our journey took us to the city of Troy, NY for the purposes of taking some photographs in the Oak Woods Cemetery, which I cannot recommend highly enough as a beautiful spot to visit if you are in the area. 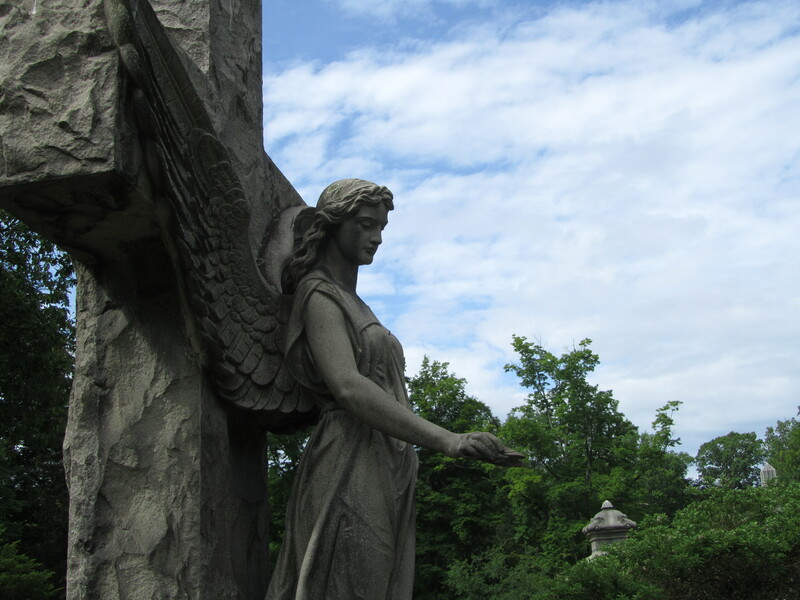 It is a garden style cemetery (local readers think along the lines of Mt. Auburn in Cambridge) and features some awesome monuments, architecture, views, and an abundance of active wildlife. It is also the final resting place of Samuel “Uncle Sam” Wilson, something that is rather central to the city’s identity. 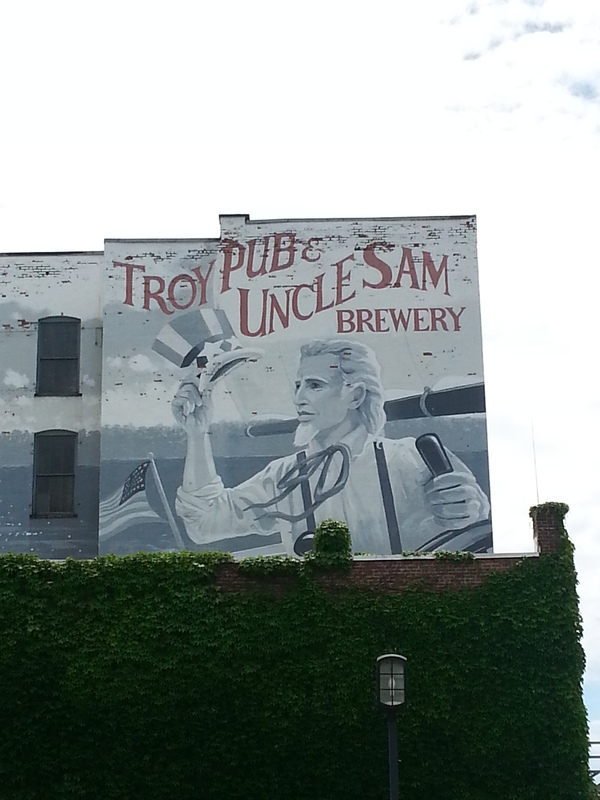 It is because of this that we happened upon our lunch spot, the Brown’s Brewing Company Taproom, which we spotted immediately after noticing a sign for the now defunct Uncle Sam Brewery on the building’s side wall. Going upstairs, we jumped at the chance to sit outside on the back deck and enjoy the nice day. They had a number of beers on tap (around 12-14 if I remember correctly), the full variety of usual suspects ranging from Pale Ales and IPAs on the lighter end of things to a few styles of Porters and Stouts on the other end. 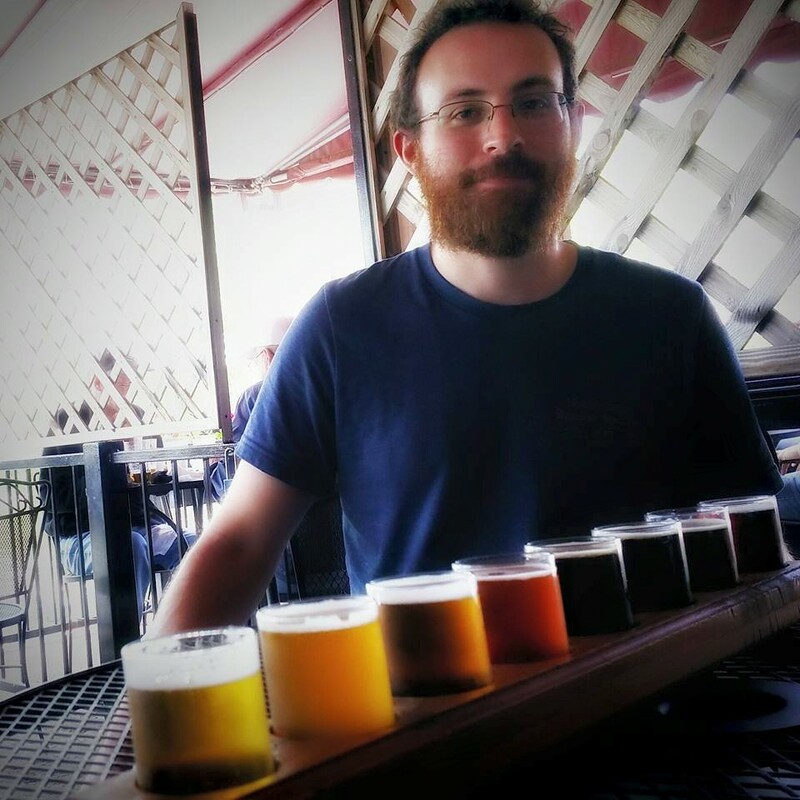 They offered options to sample the beers in flights of six or eight; obviously for the sake of research I had to go for eight. I started the flight off with the lighter hoppy offerings. In order, they were the Pale Ale, White IPA, and Riveter IPA. They were easily drinkable but otherwise unremarkable: each had a toasty/biscuity maltiness that dominated the taste in ways I was not quite expecting. While each beer did finish with a bit of sweetness, they lacked the juicy and/or hoppy bursts I’ve grown accustomed to and perhaps been spoiled by. Rounding out the lighter beers I had the Cherry Raspberry Ale, a fruit beer that came with a cherry in the sample glass. I found this one pretty refreshing on a warm day after walking around the cemetery for a few hours. It tasted kind of like a cherry raspberry soda. Potentially a polarizing beer, I liked this one more than I do the comparable Sam Adams Cherry Wheat. The darker beers were where I started to get more into things. Though I found the regular Brown Ale to be more in line with my thoughts on the lighter beers, the Maple Brown Ale was quite enjoyable. Brewed with NY State Maple Syrup, the maple really comes through and is brought to a close by a nice, slightly hot, rum finish. The Whiskey Barrel Aged Porter was also a pleasant surprise and quite tasty. It had a nice whiskey barrel taste and a solid smooth and thick mouthfeel that suited it perfectly. Lastly, the Oatmeal Stout was another solid entry in the flight. So what did I think of Brown’s Brewing? I liked it and would stop in again if I was in the area. 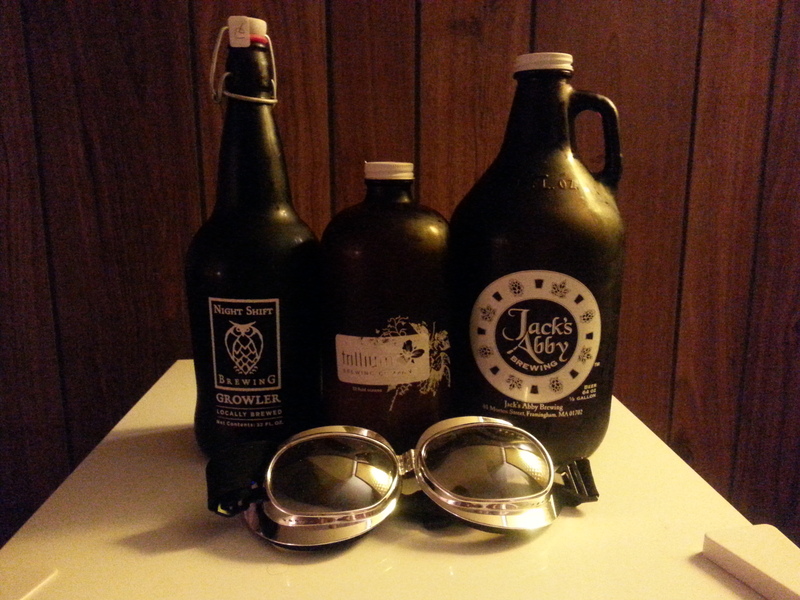 I would not go out of my way for it, but it did offer some solid brews in a variety of styles. They were also by far the most crowded eating establishment on the Friday lunchtime we were there, so they’ve got something going right for them in the community which makes me happy to see. Our next stop was a short drive south to Albany, NY to hit up a destination I had done some advanced research on, a bottle shop named Oliver’s Brew Crew. Being in this store made me feel like a kid in a candy shop. It is a warehouse-like liquor store dedicated to beer. They had a wide variety of local and nationally distributed beers to choose from, and the staff was friendly, helpful, and quite knowledgeable. The staff didn’t miss a beat in advising my wife in selecting from their stock of gluten free beers and ciders, directing another customer (without judgement or hesitation) towards the Michelob 30-racks, and giving me some great recommendations on what to get my growlers filled up with. Boat Beer was an excellent 4.2% Session IPA that certainly lived up to its reputation. Crisp and refreshing with a solid piney hop presence, this beer served well to keep me hydrated throughout the weekend. Cloudbusting was another hoppy offering, this time an 8% DIPA. It had a sweet tropical smell and an interesting piney citrusy taste. While not superlatively juicy or hoppy, the two tastes achieve a perfect balance bringing out the best of each flavor. There is a resiny and dry cracker-like finish that closes this beer out nicely. Last up was Bottle Imp, a 9% Russian Imperial Stout infused with Mexican and Ethiopian organic coffee. The taste was an excellent blend of bittersweet chocolate and light roasted coffee. Ending notes were roasty, slightly bitter coffee paired with what I want to call piney bitterness. This was a very solid beer but was prevented from stepping up the next tier by a mouthfeel that was just a bit too thin and not quite enough alcohol heat integrated into the beer. Rounding out our purchases that day, were two gluten free offerings from Albany’s own Steadfast Brewing Company for my wife: a four pack of their Oatmeal Cream Stout and a bomber of Pumpkin Spice Ale. We’re saving the Pumpkin Spice Ale for more appropriate weather, but the Oatmeal Cream Stout is easily the best gluten free beer we’ve come across to date. It actually tastes like a solid example of what you would expect from the style. Oh, and I grabbed myself a Prairie BOMB! that I expect I’ll be reviewing here at some point in the future. Oliver’s is a place I would recommend going out of your way for if you’re going to be nearby or passing through the region. First rate store with great selections, a helpful and knowledgeable staff, and growler fills. Likely the most exciting beer store I’ve been in. There ends the beer portion of my adventure. The festival was a blast but that’s a story for another blog, though my wife did get some awesome shots. 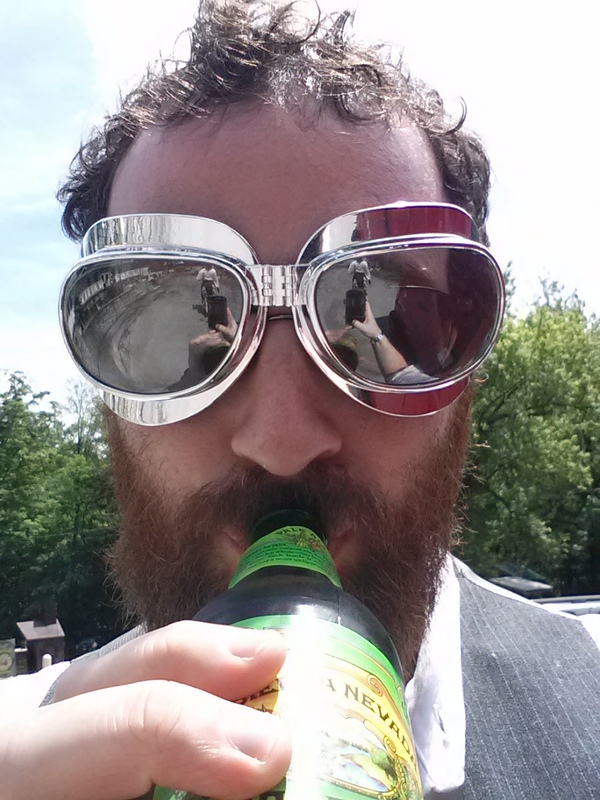 As for myself, I found time to drink a Sierra Nevada Pale Ale in style.